If you live in, or around Brisbane… and you love to sing in a choir, then why not take advantage of the FREE education event taking place on World Voice Day ~ April 16th. The Australian Voice Association , is hosting the evening and inviting people to join in and learn how to maintain a healthy voice singing. 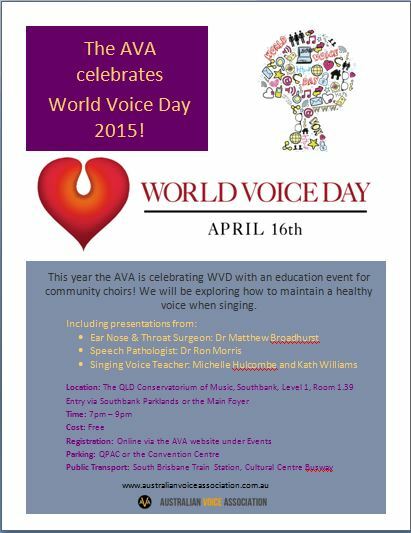 This entry was posted in Community Events, Singers and Performers, Voice Health Professionals, WorldVoiceDay and tagged choirs, free event, singers, singing, voice care, world voice day. Bookmark the permalink.